All the presenters had the daunting task of introducing VISTAs into new worlds of knowledge around the VISTA Project priority areas—Nettrice Gaskins has the double task load of covering two distinct areas: digital media instruction and youth development. Many advocates in these arenas find these foci complicatedly interconnected and interdependent. Nettrice approached her task with a dynamic method mirroring her own teaching style. 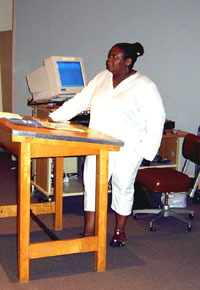 Nettrice is an adjunct faculty and computer arts academic specialist at UMass/Boston and Mass College of Art respectively, as well as a board member of CTCNet and the National Alliance for Media Arts and Culture (NAMAC). Nettrice started with project-based examples of recently completed animations, created using Frame Thief and Macromedia Flash by youth in her summer classes at Mass College of Art. By watching their vibrant work, the audience learned about the interests of each youth participant and the complexities of designing a curriculum flexible enough to work in different timeframes and situations. Through the work of these youth, VISTAs got a quick view into what outcomes are achievable in a relatively short time with the right amount of planning and effort. The field of digital media has evolved quickly. So, Nettrice’s presentation focused on how the relatively inexpensive and good quality production of digital video, animations, and web content can be used to the advantage of programs aimed at engaging youth. By adding a component of media literacy, digital media programs for youth can broach topics such as copyright and fair use, censorship, and social activism. We can make an impact on the youth’s understanding of message in media by referencing examples that the youth can relate to, such as showing less violent bits of Japanese anime (animated movies) and comparing them to more family-friendly, yet just as visually stunning anime. The impact can be substantial because it based in the language and pop culture references are familiar to the youth. Any digital media youth program warrants understanding the participants, especially such characteristics as age, social development, and life experiences. The study of youth development, in terms of digital media creation in CTCs, needs to focus on core youth needs and positive outcomes. Nettrice also touched upon the need for instructors to be flexible, based on an early assessment of the group’s level of development and remembering that youth are very different learners than adults. Nettrice’s experience developing a curriculum for the DigitalArts Youth (DAY) program acted as a model reference for advising VISTAs in creating new programs for their centers. Once you know the basics, you can design a program based in five stages: survey, plan, acquire donations, train and create resources, and implement and document. Surveying means taking an assessment of both the youth and the center’s current technology. As an experienced program developer, Nettrice has collected and shared many assessment tools useful in determining the current skills of the youth and the educational objectives a program should include as well as technology needs. Planning for a strong digital media program should follow a pathways model, with levels based on student skills, type of digital media (still, dynamic, and interactive) and encouraging leadership, teamwork and community building. During planning, the curriculum can be built not only upon project goals but also relevant standards such as state or public school standards matrices (check out the NY Foundation for the Arts and the DAY program’s resources). Finally, a curriculum should be based on key activities and scenarios using youth-centered techniques such as project-based learning or digital storytelling. Acquisition involves creating a priority list of technical needs and gathering donations to fill those needs. Training involves instructing not only the program staff but also peer leaders. Nettrice cited one 13-year-old participant in her summer class, Nani, who seemed unlikely to complete the program because of her lack of attention span and tendency to act out. But when she was given positive one-on-one attention, she showed amazing adeptness in Macromedia Flash and became an active leader willing to help those around her. The final stage of program design is the actual implementation of your plan, including documenting the youths' achievement through electronic portfolios (websites, compact discs, and DVDs). This stage includes both quantitative and qualitative assessment and evaluation. The overall presentation conveyed the importance of youth-centered programming, while several of the animations reflected youth concerns about violence in media and their own neighborhoods. (To see clips of the youth-based computer animation content, check out Nettrice’s portal: http://portal.nettrice.us/bm.) Their work proved that the youth had not only learned the tricks of media creation, but they had also learned to use digital media as a form of self-expression.